REVIEW: KAABIL IS FOR DIE-HARD HRITHIK FANS! Hrithik Roshan has played challenging roles before and nailed them to perfection. This time too, he doesn’t disappoint, says Namrata Thakker. Sanjay Gupta returns with yet another thriller after the Aishwarya Rai Bachchan-starrer Jazbaa. 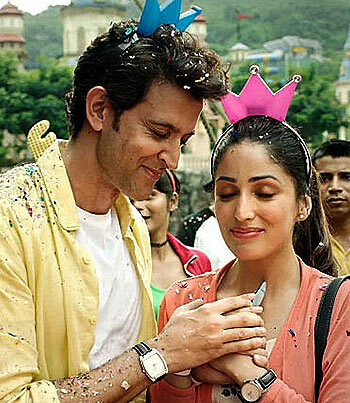 Kaabil, starring Hrithik Roshan and Yami Gautam, is not extraordinary fare but Hrithik's earnest performance makes it watchable. Rohan Bhatnagar (Hrithik) is a voice-over artist, who instantly hits it off with Supriya when they go out on a blind date. Their romance quickly blossoms and before you know it, the two are married. Despite being blind, both of them believe in living their life to the fullest, and they do. Remember all that tango from the promos? Sadly, their lives turn darker when Supriya gets raped by Amit Shelar (Rohit Roy) and his friend Wasim. The former is the younger brother of MLA Madhavrao Shelar (Ronit Roy). Though an FIR is registered, the police fail to take any action for obvious reasons. So Rohan decides to take revenge on his own. Story wise, Kaabil is predictable and that’s a big spoiler. The few scenes where special effects have been used are done very badly and you wonder why when the film’s budget is good enough. The first half of the film is slow and the story actually takes off only just before the interval. The songs could have easily been done away with because thrillers shouldn’t have them in the first place. The remixed version of the two yesteryear songs -- Saara Zamana and Dil Kya Kare -- also fail to add any value to it. The second half is better than the first as all the action takes place post-interval. Hrithik Roshan has played challenging roles before, like Koi... Mil Gaya and Guzaarish, and nailed them. This time too, he doesn’t disappoint. While he may have gone overboard in a few scenes, overall, he's quite good, especially in the action sequences. Also, he has got some dhamakedaar dialogues! Apart from action, Hrithik also shows off his dance moves in the film. Now, that may not go with the flow of the film, but it’s always nice to see him dance, no? Yami Gautam looks pretty, but that’s it. Even her chemistry with Hrithik doesn't work. Rohit and Ronit Roy play their parts well. The good-looking television actor brothers seem have perfected the art of playing badass villains. Actors Girish Kulkarni and Narendra Jha lend good support to the story. Kaabil is a onetime watch only because of Hrithik Roshan. If you’re a die-hard fan, go for it.